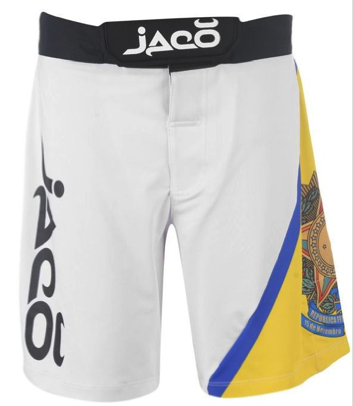 The Brazil Resurgence fighter short dawns the Brazilian Flag on the left leg and provides all the technology that makes the Jaco Resurgence fighter short perform at the highest level of MMA competition. Patent-pending compression waist-tightening system that can be tightened without creating “ scrunching or cinching” around the waist while providing a comfortable, no-slip fit. This system provides a compression style fit internally to the garment that allows the external look of the product to remain unchanged. Internal stretch pocket located at the bottom of the shorts’ leg opening so that you don’ t have to untie your shorts every time you want to stow your mouthguard. This compression style pocket is designed to hold the mouthguard (or locker key) so that it does not “ flop” around while working out. Fly backing panel construction to prevent rubbing and chafing from the fly’ s hook and loop material. Raised “ Tenacity” Icon Logo on the rear, center of waistband (patent-pending).